To be honest, I’m not really looking forward to watching the broadcast of this weekend’s NASCAR race at Chicagoland Speedway and all because of Dale Earnhardt Jr.
Not because I don’t like Earnhardt Jr. On the contrary. I truly like and respect the man and always looked forward to talking to him and, most important, listening to him, at tracks on race weekends. His on-track accomplishments mattered little to some of us. We liked him not because he was like his father but because he was, in many ways, not like his father. The problem is, I’m not sure we will like him and respect him after the red camera lights go off late on Sunday afternoon at Chicagoland Speedway. But, geez, I hope so. The racing world knew years in advance of his decision to retire after the 2017 NASCAR Cup season that Earnhardt’s future resided in a glass booth. Q Rating-obsessed wonks fantasized about his TV debut. They have had to use industrial sized microfiber towels to clean the slobber off their shoes in anticipation of the man’s move to the booth. When he did announce his retirement, and the announcement was made that he would join NBC Sports’ group of analysts, good feelings mingled with relief around the sport. At NBC Sports, the mood has been one of jubilation. As the Fox Sports portion of the season (thankfully) wound down to last weekend’s curtain-closer, the Junior countdown over at the Peakcock neared zero…ignition…liftoff. The debut of Junior, aka The Savior, was plugged ad nauseam during commercial breaks across all of the network’s platforms last weekend. There were more house ads that featured Earnhardt putting on his head set than there were commercials featuring and impossibly good-looking young actors having the times of their lives while eating Big Macs and responsibly drinking beer at poolside fashion-fests. The need for a savior is understandable considering for the abysmal television numbers in recent years and the fact that the 10-year, $4.4 billion rights deal NBC signed with NASCAR in 2014 still has six years to run. But therein lies the basis for some angst. 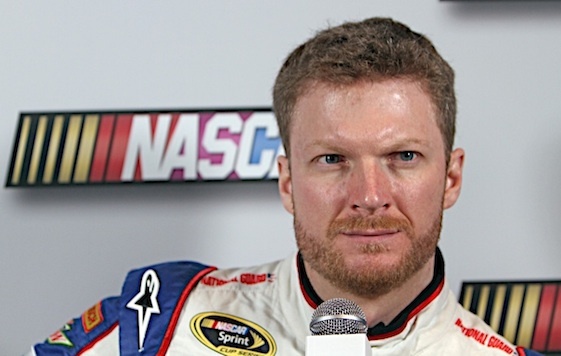 The pressure is going to be on Earnhardt Jr. to hit grand slams every time he steps right up to the microphone. That pressure, as evidenced every weekend of racing season by television viewers, can cause the most sturdily reflective of personalities to voice goofy crap: Goofy crap that even they don’t believe but voice anyway as unseen production types are urging them onward in their earpieces. An old friend from the college days who went from real journalism to television sports once told me that when the red light goes on, dead air is a much more serious sin than saying goofy – even misleading or untrue – crap. Increasingly in recent years, sports coverage has abandoned its traditional role of purveying independent, unbiased reportage and analysis. Those entities which televise events have unapologetically become “broadcast partners” with the leagues, conferences and series that they “cover”. Reporting has been replaced by shilling. And when things turn bad for a sport and, hence, for its broadcast partner, the pace of the cheerleading picks up proportionately. Things in NASCAR have turned really bad over the past 10 years. A result for those who watch broadcasts has been semi-constant prods about how exciting the racing has been, is and is sure to be: Hang on to your undies folks, the finish of this race is going to an epic sandwich surround by two slices of awesome and tremendous! Check the batteries in your pacemakers! No matter that the races have been, more often than not, complete dogs and a complete wasting of three hours of beautiful Sunday afternoons that can never be recaptured. Compeitors whom I have respected in the past have boarded the shill-bound train and it has been disheartening and aggravating. Former champions and once-successful crew chiefs have first class seats on the train. No, broadcasters and networks do not need to be constantly harping on negatives. That would be tedious and unfair. But they owe it to the fans – many of whom know the sport as well or better than play-by-play throats – to keep it honest. In a phone conversation this week with colleague Jonathan Ingram – who does, in fact, know the sport better than much of the on-air “talent” – it was agreed that if anybody can stand up to the pressures to sport-promotional blather, it is Earnhardt Jr. Junior has broken ranks with NASCAR’s version of events repeatedly over the years. Perhaps because he knows his power among fans and viwers, perhaps because it’s part of who he is. In the past, Junior has shown that he knows who pays his bills and also why they pay those bills. Here’s hoping Junior stays Junior over the coming months and beyond.